Award panel members honored Michel T. Kohl with the 2017 Murray F. Buell award. Kohl is now a postdoctoral fellow in the Jack H. Berryman Institute at Utah State University after receiving his PhD this past year. 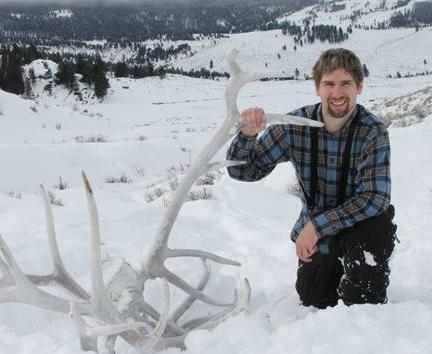 His oral paper investigated whether elk in Yellowstone National park selected their habitat based on the activity schedules and space use of their predators, cougars and wolves. He found that elk frequented open areas at night when wolves were not as active, but selected forested areas in the day when cougars were not as active. Together, this allowed elk to avoid both predators simultaneously while still providing access to high quality forage. Judges were impressed my Michel's thorough background information, his compelling analyses, and great answers to post-presentation questions. The 2017 E. Lucy Braun award was won by Benjamin J. Wilson, a postdoctoral researcher at Florida International University, who recently defended his dissertation entitled, "Drivers and Mechanisms of Peat Collapse in Coastal Wetlands." Wilson's poster presented research findings centered around exploring if the negative impacts of saltwater intrusion in the Everglades could be offset by the increase in phosphorus load that accompanies such events. He found that gross and net ecosystem productivity both increased with saltwater influx, possibly due to the associated increases in phosphorus. However, salt negatively impacted root growth and led to an overall decrease in elevation. Judges were impressed by Benjamin's clear explanations, great visualizations, and careful execution of his experiments. ESA invites press and institutional public information officers to attend for free. To apply, please contact ESA Public Information Manager Zoe Gentes directly at [email protected] Walk-in registration will be available during the meeting. The Ecological Society of America (ESA), founded in 1915, is the world's largest community of professional ecologists and a trusted source of ecological knowledge, committed to advancing the understanding of life on Earth. The 9,000 member Society publishes five journals and a membership bulletin and broadly shares ecological information through policy, media outreach, and education initiatives. The Society's Annual Meeting attracts 4,000 attendees and features the most recent advances in ecological science. Visit the ESA website at http://www.esa.org.